I just wanted to share my latest Make Art That Sells project. 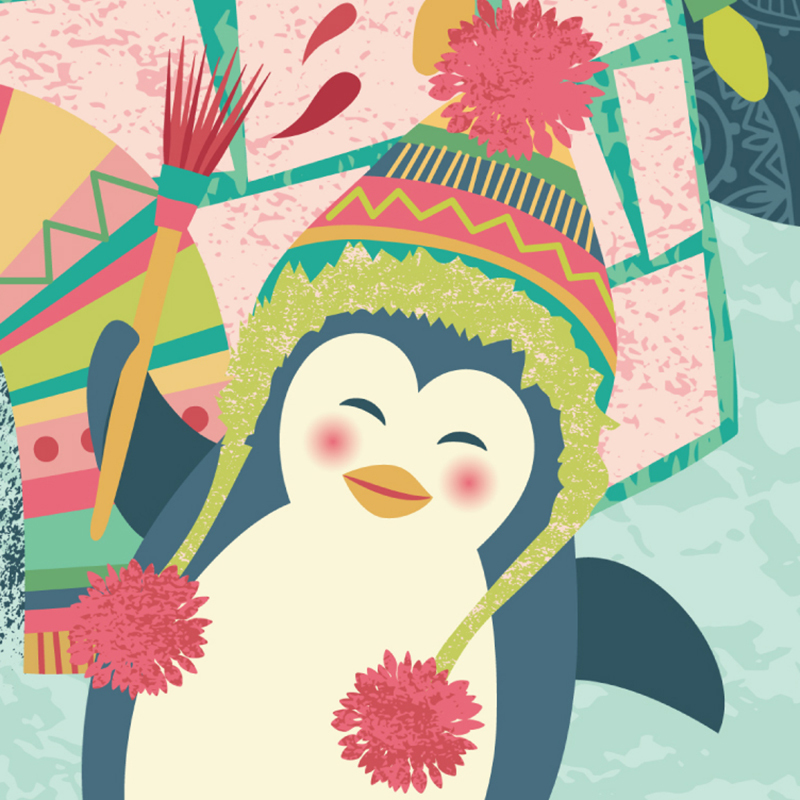 Make Art That Sells, by Lilla Rogers, is an online course that I started last week. Lilla is a well-known artist’s agent and put together a very inspiring, educational, exhausting, exhilarating, and fabulous 5 week intensive course. I took the first part a year ago, now I am taking Part B. It’s really challenging, we have to complete a project each week based on a detailed brief. Every brief is geared towards a different market with a unique theme. 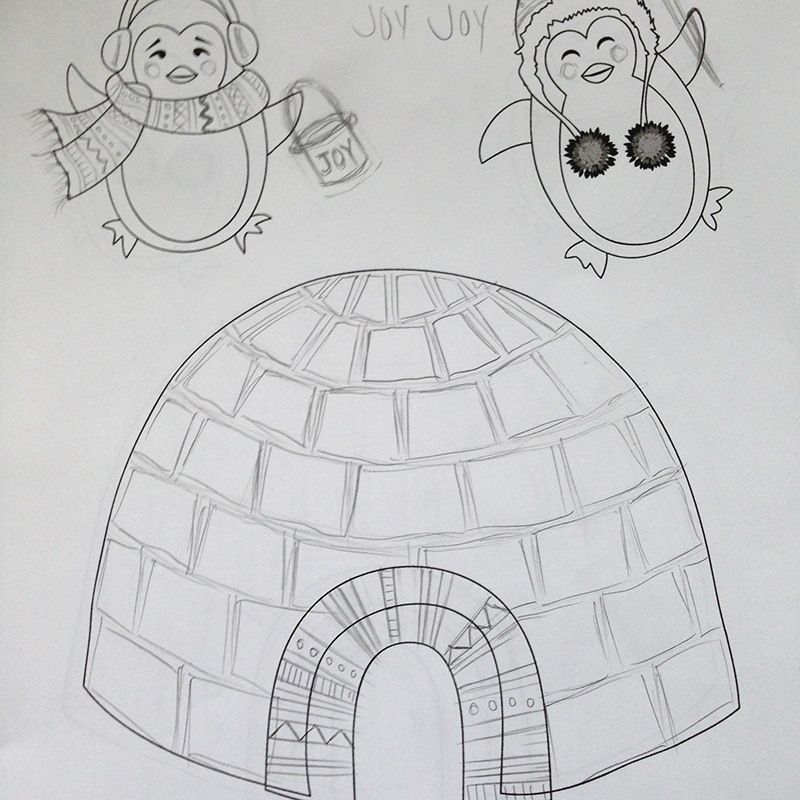 Last week our project was a holiday greeting card incorporating penguins and igloos. It was super challenging for me because I haven’t really done many animals or characters. 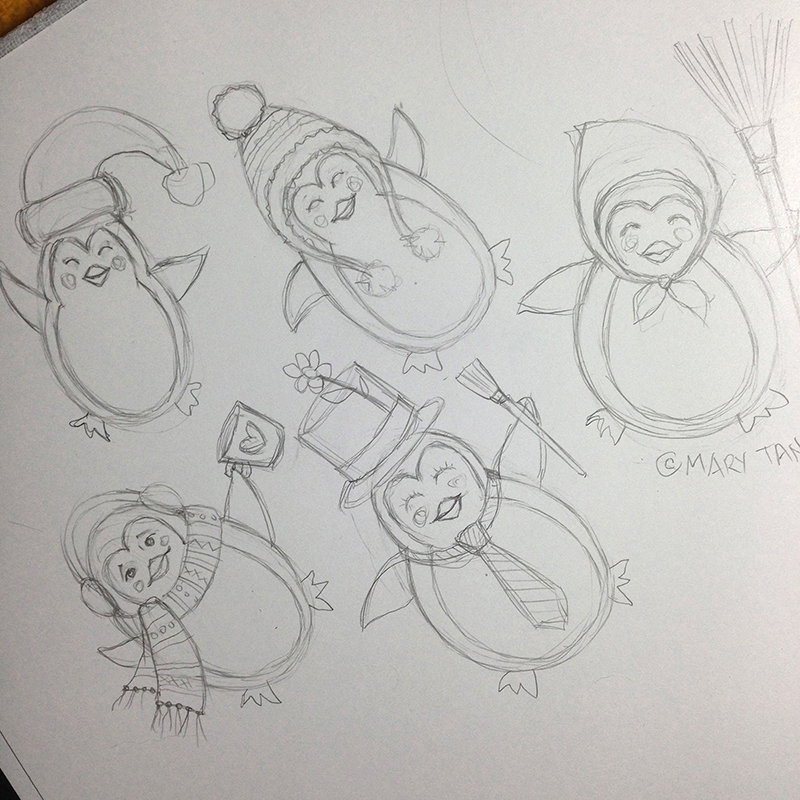 I started out doing lots of penguin sketches! I really had fun with it. This course is always surprising me with how I respond to the projects. What I usually do is draw the frame or basic outline of my icons on the computer using Adobe Illustrator, then I’ll print them out, draw in the details, scan them back in, and continue to draw them in vector on my computer. I usually will draw my words on graph paper. I added loads of texture on this piece. I’m so happy how it turned out! Here is the finished piece. I’m thrilled with the result. Next week is Baby Apparel. Cowboys and Cowgirls. Eep! 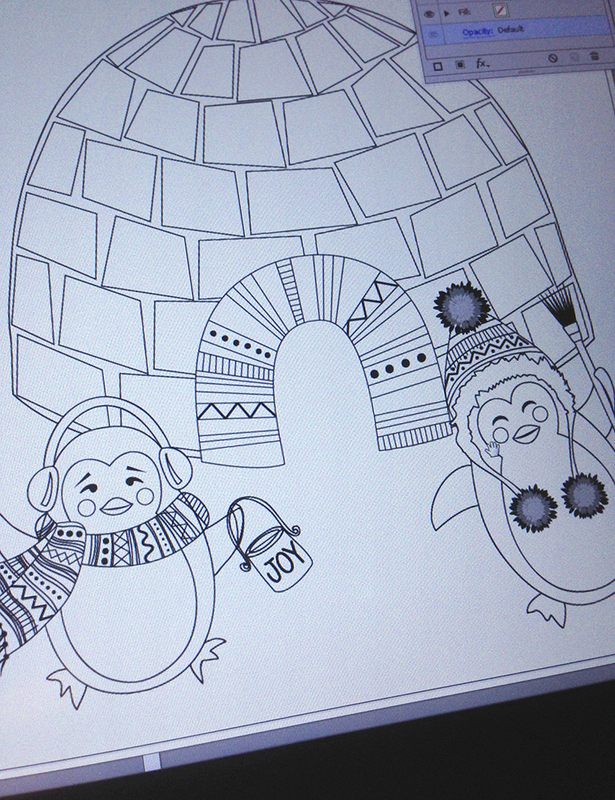 I was wondering what you were up to with those penguins on Instagram?! 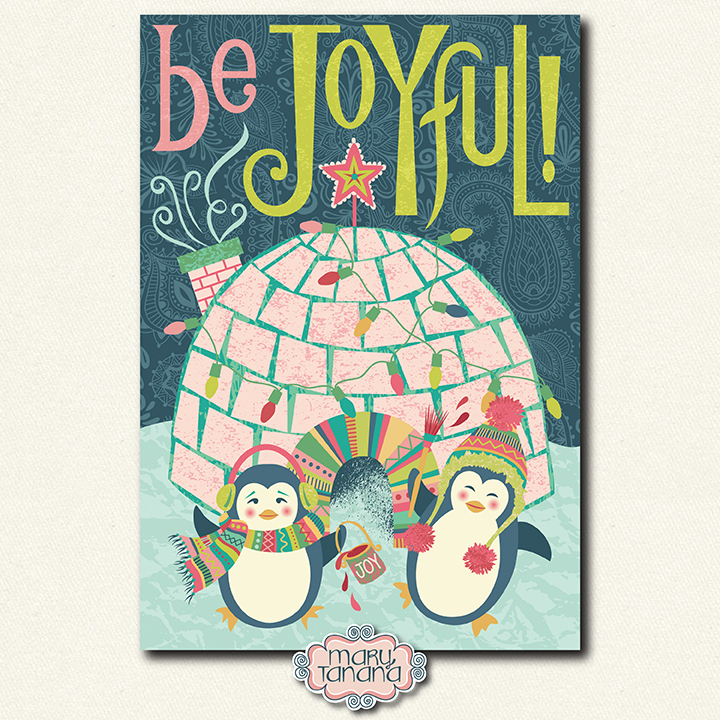 I love your piece- very joyful. Best of luck with next weeks – cowgirls really!? thanks Julie! Yeah, cowboys and cowgirls. I’m totally freaked out! Give me camping and pirates, haha! For stepping out of your comfort zone you created a beautifully successful illustration without compromising your unique style. Great job! 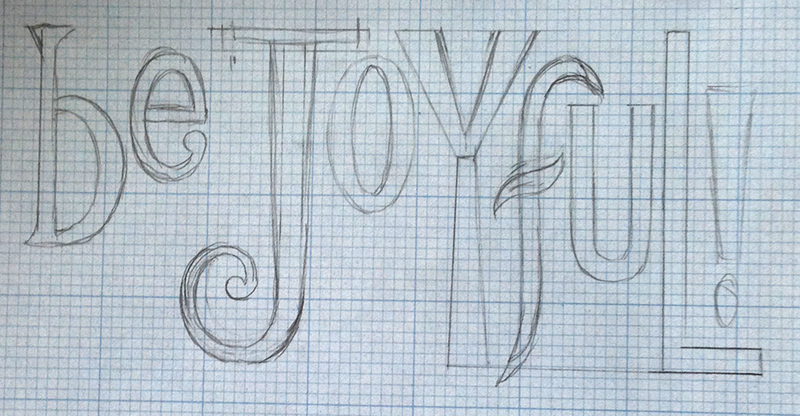 Great design and love the tip about graph paper lettering. Look forward to seeing your cowboys.